Jason Nichols: Donald Trump makes everything about his own ego. Including the Philadelphia Eagles. Jason Nichols Donald Trump makes everything about his own ego. Including the Philadelphia Eagles. The man seems to have difficulty seeing the difference between him and the institution that is the office of the president. It's possible that he feared the embarrassment of another poorly-attended event like his inauguration, rather than that he really felt the flag would've been disrespected. Trump’s ego can be seen from a mile away. He uses grandiose terms to describe himself and his accomplishments. He coaches his own cabinet and foreign leaders to praise him in front of the media. It is known around the world that playing to Trump’s ego is advantageous. There are even some psychologists who have analyzed Trump’s behavior from afar and believe him to have a Narcissistic Personality Disorder due to his “inability to subordinate his hunger for affirmation” and complete intolerance for criticism. Examples of the above can be found in his statement about the event: He referred to himself as “their President," rather than speaking in first person, which was also an obvious attempt to assert his rank and make it seem as though the reported decision of many of the Eagles players not to celebrate with Trump was inherently disrespectful to the office of the presidency. Trump’s ego, it seems, does not allow him to see the difference between himself and the institution that is the office of the president, much in the way a tyrant does not. Saying the Eagles players’ decision not to attend the White House is disrespectful to the presidency is equivalent to believing the Montgomery Bus Boycott was disrespectful to bus drivers. But even if they players to whom he showed such disrespect had kneeled during the anthem, it was neither disrespectful to the presidency, the military or the American people. The original decision to kneel, rather than sit, during the National Anthem was influenced by former Green Beret Nate Boyer. Boyer wrote to Colin Kaepernick and the two met and came to the conclusion that kneeling would be show respect for the sacrifices that military personnel had made and still make for our country while still embodying the spirit of the protest. Since then, NFL players have received support from a large number of veterans and active duty servicemen and women. To boot, Eagles player Chris Long was among the players who had reportedly refused to attend Trump's congratulatory ceremony (where it is not unusual for the president to make biased or self-aggrandizing remarks that mar the experience). Long, the grandson of a WWII veteran, works with military veterans through his organization, the Chris Long Foundation; he's a poor poster child for Trump's efforts to paint NFL players as unpatriotic. The president’s ego is so fragile that he must hit back at anyone who admonishes him. In a more recent example, Trump also allegedly could not recall Gold Star Sgt. La David Johnson’s name in a phone call to the man's widow and referred to him as “your guy”. He also allegedly claimed that Meisha Johnson’s husband “knew what he signed up for.” Sgt. Johnson enlisted to defend his country against enemies, foreign and domestic — but not to have his wife called a liar publicly by the commander in chief. The president’s ego is so fragile that he must hit back at anyone who admonishes him, even a grieving widow of a soldier killed in a battle for which, as president, he is ultimately responsible. Donald Trump needs everything to be about him: He can't simply celebrate the accomplishments of the teams that win national athletic tournaments if every member won't show fealty to his administration despite his constant veneration of the divisiveness he stokes. He can't simply offer condolences to the grieving families of people killed in combat unless they show deference for his position. He can barely host a cabinet meeting about policies to Make America Great Again — benighted as those policies are — without demanding that everyone flatter him first. On this occasion, however, he’s correct that the cancellation of the event with the Eagles is all about him. His disregard for American principles, First Amendment rights and his petty, childish and vulgar responses to criticism means that players on major championship sports teams like the Golden State Warriors and the Philadelphia Eagles do not want to be photographed in the same room with him or used as the backdrop for his latest off-the-cuff insults. But, it is entirely possible that the Eagles Nation (many of whom live in the swing state of Pennsylvania) will remember this insult against their first Super Bowl winning team in 2020. 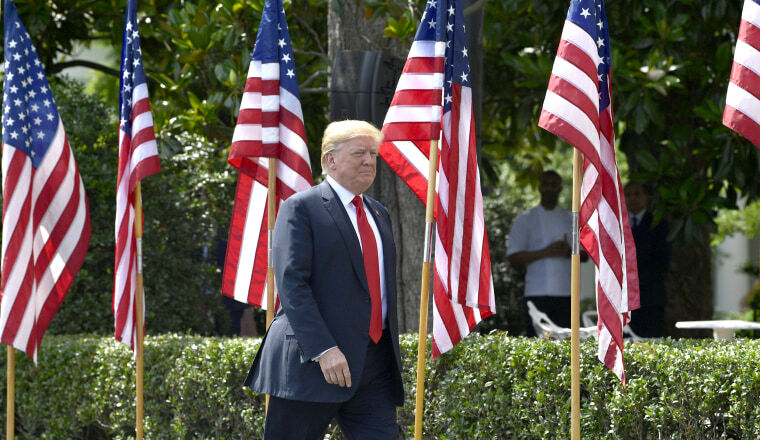 Goodness knows that the president's alternative event celebrating the flag was completely forgettable, except for the one man who knelt during the anthem on the White House lawn.